Mobile World Congress 2017, Barcelona: Would you feel safer if your jacket was online? 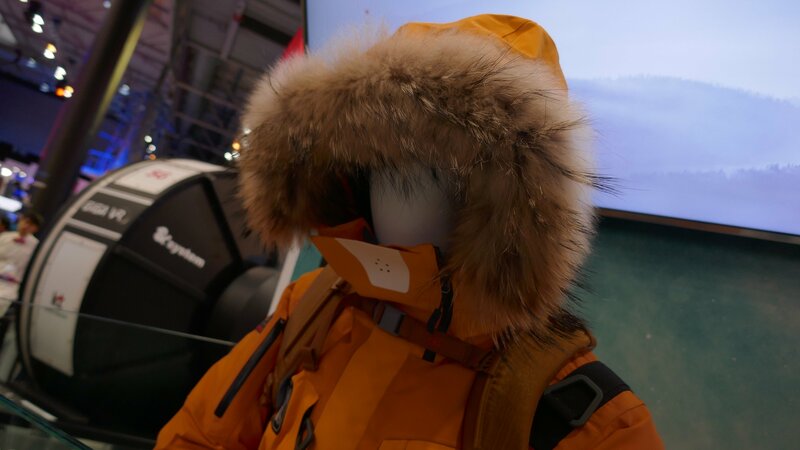 I Barcelona last week, Korea Telecom debuted its IoT Safety Jacket, a collaboration with Kolon Industries that sees a down jacket fitted with a cellphone SIM card. However, unlike the latest smartphones, this jacket uses the same low power, wide-areas networks that are used by street lights, smart bins and sensors on farm equipment. A so-called NB-IoT module (narrowband Internet of Things) module is sewn-in to the coat alongside a GPS sensor. But not only can emergency services find you, but they can also check data from the coat’s heart-rate sensor and a six-axis sensor that sends them data on temperature,. Basically, they can see if you’re still alive post-avalanche. There’s also an alarm fitted, with a buzzer and a LED lamp in the coat. The drawback of all this? One pocket contains a battery. KT was also showing a maritime version of the jacket that is connected not only to the phone network, but to a satellite for when you’re far out to sea. Not surprisingly, the jacket also has an inflatable ‘rescue tube’ built-in – and a waterproof pocket for the IoT module.